Our product is sold through select Distributors. Please contact Customer Service 1-800-328-4655 (personally answered) for the nearest distributor. Jobber Length. Super Premium 135° split point drills will substantially outperform cobalt drills in work harding stainless steel applications. NEW! M42 Cobalt Taps. High performance reduced neck with spiral point taps and Straight flute hand taps can be used by hand or tapping under power. NEW! Solid Carbide Straight Flute Drills. 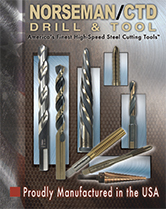 We offer a wide range of specialty tools including: Acrylic drills, Left-hand spiral drills, Hex Nut Bridge Reamers. Variety of sizes of sets, ranging from 4 piece tool sets up to 115 piece sets. All sets packaged in sturdy steel and hard plastic indexes. Coating hardness is measured in HV (Hardness in Vickers) Heat treat M2 as base drills before coating would measure 880 HV (65RC).